Choose Full Dropbox — Access to all files and folders in a user’s Dropbox. Think up a name for your app. For example, your site or application name. Click Create app. The new application will be created. Before connecting the app, you need to increase users limit, to do this Click Enable additional users. Find App key and App secret and copy them. 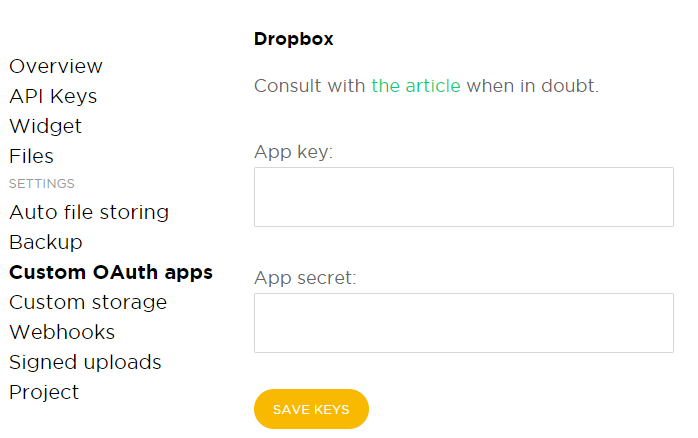 Got to Dashboard, open the Custom OAuth apps page, select Dropbox and fill in the App key and App secret fields with the keys you got from Dropbox. Click Save Keys. Now you can test your app. Find Demo section on Widget page and try to connect Dropbox. If everything done right, you will see the request from your app. After that, you will need to apply the app for production. Go back to the app settings page and click Apply for production. Follow the instructions to send the request.